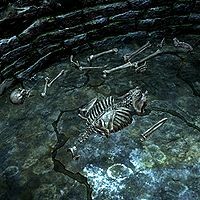 Anders is a named skeleton found in the Twilight Sepulcher. His message suggests that he was the unscrupulous killer of Nystrom and that he starved to death after trying to break into the sanctuary. It contains a leveled enchanted dagger in addition to the note and standard loot. This page was last modified on 16 October 2017, at 15:36.